Original Western Movie posters all framed by request. We have a series of original full sheets framed and 1/2 sheets (Inserts) Set of 6 Buster Crabbe "Billy the Kid wanted...etc Alan Rocky Lane, Joel McCre and Roy Rogers, Gene Autry, Even an autographed Movie Poster. Original Western Movie posters all framed by request. 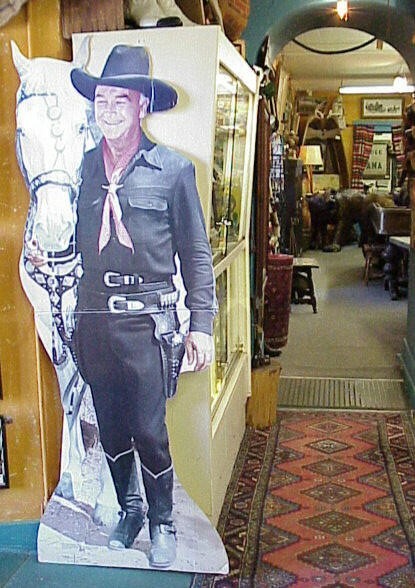 We have a series of original full sheets framed and 1/2 sheets (Inserts) Set of 6 Buster Crabbe "Billy the Kid wanted...etc Alan Rocky Lane, Joel McCre and Roy Rogers, Gene Autry, Even an autographed Movie Poster. Please email cowboycabin@centurytel.net with questions or call 406 270-2842.